A few months ago, we ended my Dragonlance campaign. We had to end nowhere near the ending of the Age of Despair storyline (the original module storyline from the early 90s and the Chronicles trilogy) because of life stuff, but I’m finally getting around to writing a bit about the ending and the experience overall. 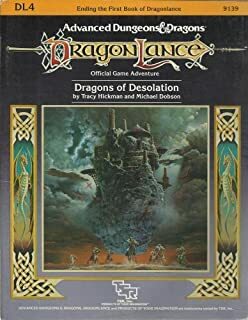 I ran a flexible version of the first four modules from the original Dragonlance series published by TSR back in the 90s: DL1 through DL4. Once thing I noticed, which was interesting, is that the number of sessions it took to get through those modules, even though at times I changed them, skipped parts, or added to them based on the players’ in put, was exactly what they predicted: 24 sessions. I just thought it was interesting that the estimate was so close, even going from AD&D to 5th Edition. Krynn is famously ridiculous for the number of comic-relief races they have in the setting: kender, gully dwarves and gnomes all serve as different kinds of comic relief in the setting and stories, and all three of those races have some profoundly annoying features. Kender basically beg players to steal from each other, behave randomly and completely sabotage any attempts at gravity in the story. Gully dwarves are offensively stupid, and an excuse for all other races to have a race that they treat with contempt at every turn. Gnomes are supposed to talk so fast that their words string together into huge run-ons without pauses, and while this can be funny a couple of times in a book it is beyond annoying to have at the actual table in play. Additionally, they are zany inventors who are steampunk when everything around them is pseudo-medieval fantasy. None of their inventions work, but they are obsessed with them anyway, and so on. This campaign had no kender, no gully dwarves, and no gnomes, and no one missed them. The few gully dwarves who come up in the original modules I altered to make into goblins, who were not necessarily stupid but spoke in simple sentences because they didn’t have a strong grasp of Common most of the time. They were even sometimes empathetic characters because they were either living on their own in tribes or were beaten and intimidated into service by the Dragon Highlords. It worked fine, and you still had your Sestun and your Bupu and so on. Because we had to end early, we ended with an epilogue for each of the characters. This was probably more than our two players who were kids could really manage – they were upset that we had to end the game because of Grownup Stuff, and didn’t really get the idea of an epilogue (one was 9 and one was 13 at the end of the campaign, having started at 8 and 12). Still, it was the best I could do. I feel like if you have to end early, the least you can do is try to provide some closure. Not easy at the end of the 4th out of 14 D&D modules, but there you have it. I finally finished a rough conversion of the draconians of Krynn to 5th Edition. The easy way would have been to just make them dragonborn, but I wanted to retain that AD&D flavor, ridiculous death effects (I’m looking at you, Auraks), and general feel. Comments are welcome, as always. I was a little hesitant to post these, as I don’t want to spoil the surprises in store for my players, but then I remembered: very few people read this blog, and I doubt that list includes my players. I added a few things based on the color text in the Dragonlance Campaign Setting book put out for AD&D, like specific rules for the sivak’s tail sweep, and also removed some things like the aurak’s breath weapon, because…they’re already pretty ridiculous. I also took a shot at defining a challenge rating for each of them, but the aurak in particular was kind of hard, and really I just eyeballed them. Season to taste. Death effect: on death, they turn to stone, and if killed by a piercing or slashing weapon, the wielder must pass a DC 12 Dexterity save or have their weapon stuck for the 1d4 rounds it takes for the baaz body to crumble. Death effect: at death, a kapak immediately dissolves into a 10’ wide pool of acid that deals 1d8 damage per round. The acid evaporates after one round per HD the kapak had. Kapak poison: kapaks have venomous saliva, and lick their weapons before battle. If they deal damage, their victim must make a DC 12 Con save or take 3d6 (10) additional poison damage. If they fail the save by 5 or more, they are paralyzed. Once poison damage is dealt, the victim is immune to further damage from kapak venom for 24 hours. Death effect: A sivak can polymorph into the form of any humanoid it kills, and when killed, the sivak assumes the form of whomever killed it for 3 days, after which it decomposes into black soot. A sivak killed by something larger than itself bursts into flames, dealing 2d4 fire damage to everything in 10 feet for a round. Death effects: at 0 hit points, the aurak does not die but rather bursts into flames, dealing 1d6 fire damage to anyone who hits them in melee. At -20 hp it turns into a ball of lightning, dealing 2d6 lightning damage on a hit for 3 rounds, after which it explodes, dealing 3d6 fire damage to all within 10 feet and stunning them if they fail a DC 14 Con save. enlarge, shocking grasp, detect thoughts, stinking cloud, blink, lightning bolt, fire shield, wall of fire. 5E D&D Dragonlance: Reorx’s Forge! I recently got a comment from another D&D player asking how I would run Reorx in the Dragonlance setting. As far as 5E is concerned, Reorx is a neutral deity with the Knowledge domain – the problem is that Knowledge isn’t a good fit for an artisan deity. There isn’t a better fit among the PHB’s few domans, so I got to thinking about how I would hack Knowledge to represent something more like Artifice, Craft or Creation. Here are my thoughts so far. At 1st level, you are proficient with two additional tools in addition to two of the following skills: Arcana, History, Nature or Religion. Your proficiency bonus is doubled for any ability check using the two selected tools. At 2nd level, you can use your Channel Divinity ability to locate an object, as per the Locate Object spell. In addition, after you have found the object, for 10 minutes per cleric level, you are proficient with it. At 17th level, after 10 minutes of prayer and supplication, you are able to conjure a vast dwelling like one you would find in your deity’s home plane. This ability is essentially Mordenkainen’s Magnificent Mansion.